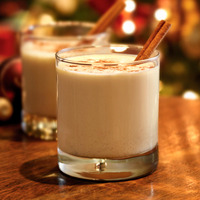 A creamy homemade-style eggnog, spiked with rum and warmed with festive spices. This takes a month to steep, and releasing it a week before Christmas means I really screwed the pooch, here. Too bad, because it's festive AF. Oh well! There's always next year, right?